6th Annual 1880 / 1780 Doubles Championships! 1880 DUBS is a Bring Your Own Partner, multiple format, ratings capped doubles competition based on you and your partner's 2016 PDGA or KDGA tournament performances. 2 Divisions are offered: 1880 and 1780. A team's combined player ratings may not exceed the divisional cap. 2 rounds of 20 holes played in a variety of doubles formats including Best Shot, Tough Shot, Alternating Shot, and Switch Shot. $70 per team (Includes 2 tourney-stamped discs, online fees, and an small ace fund). CASH PAYOUT! SIGN ME UP! : This event fills quickly. Player ratings will be locked after Sept 18th. Online Registration will run 7 DAYS ONLY from Sept 19 thru 26th. NO SIGN UP after the 26th. LET ME IN ALREADY! : Want to ensure you and your eligible partner get a spot? Don't mind helping fund K-Ratings and course maintenance? Consider donating early. A donation of $100 or more pays your team's entry, secures your spot before registration even opens and gets you first choice of tournament discs and starting holes. Donate today! Last edited by Swede on Tue Sep 20, 2016 10:38 pm, edited 3 times in total. I am interested in finding a partner and playing this tournament this year, but I don't seem to have a K-Rating. Played Hutch and the Keeper. How would I calculate my K-Rating based on these 2? lazjak wrote: I am interested in finding a partner and playing this tournament this year, but I don't seem to have a K-Rating. Played Hutch and the Keeper. How would I calculate my K-Rating based on these 2? You should be good to go after Swede gets the ratings in there for Keeper. You need at five rated rounds to be eligible to play in the tournament, I suspect you don't have a rating showing up on there yet since you only had the two as of the last update. Sorry Jake, you and a few other folks had everything except the 1 field you needed filled in. Think I fixed it. 985 is where you are sitting. The tourney officially fills 2 teams at time by division to ensure we have equal numbers in each. Do me a solid and post your teams. I need a head start on team names! Please make the best teams you can. My original goal for this tourney was to have 1 division where every team has a chance to win. Give yourself a chance to win and make some new connections in the process. Use this forum or hit me up if you need some help. Ratings are up through Hays. I'm not going to set lower limit to team ratings but if you submit a team that isn't competitive, I will ask you to find new partners. Been struggling with how to handle this. My vision for this tourney is to provide a level playing field. That is the reason I pour the hours in. If you don't attempt to make a great team, I've wasted my time and you've taken the spot of two people who could have won. I know some people want to do this for kicks. I know it's not always easy to branch out. But we'll have a better tourney and we'll build a better DG community if you make an effort. This is a unique beast of an event. You'll do a bunch of things you don't do at any other other tourney. Embrace it. 1880 is about competition and connections. Keep some of both in mind as you're pairing up. Last edited by Swede on Mon Sep 26, 2016 11:52 am, edited 1 time in total. 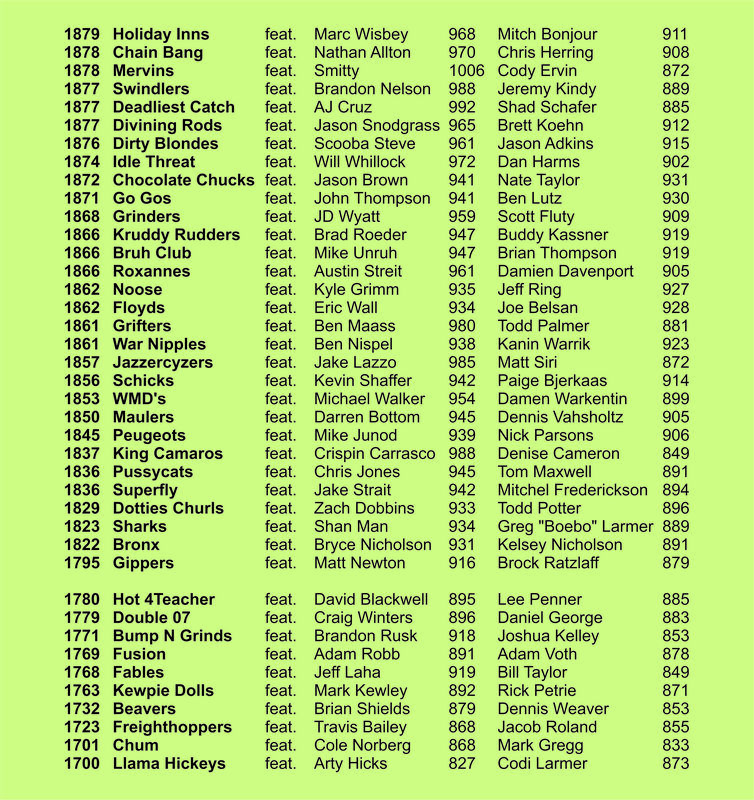 Please put Klay Bouray (932) & myself Evan Tacha (910) on the waiting list in case a team drops, we want to play. Another Great Day At The Hawk, Thanks Swede and crew for all you do!! !